The Magdalenian was still a time of intense glaciation, although the climate had been slowly warming since the Last Glacial Maximum at around 26,000 years ago [5-6]. During this period hunter-gathers moved into Southwestern Europe to avoid the harsh climate of the Last Glacial Maximum, returning through Central Europe to repopulate more northerly climes . Similar to the Gravettian that preceded it, the Magdalenian was also a highly unified culture over a broad expanse of territory within Europe. While Gravettian hunters had focused on mammoth, the Magdalenian saw a shift towards a focus on hunting horses and other large game . 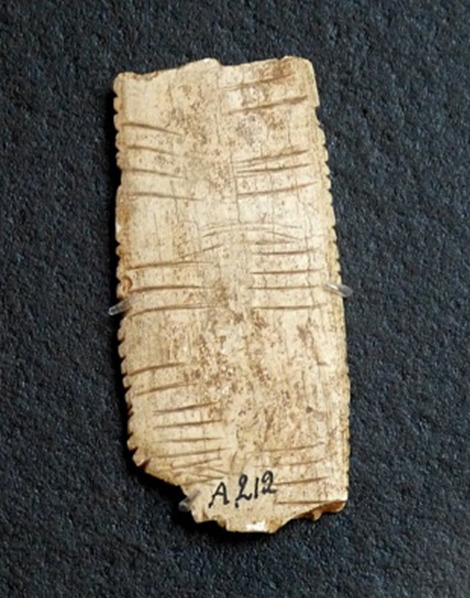 This culture produced incised bone objects that archaeologists have proposed to be some form of Paleolithic tally-sheet , although their purpose remains unknown. The single individual in this sample came from the cave site of Rigney 1 in the surrounding countryside of the village of Rigney, which is located 23 kilometers (14 miles) from the city of Besançon in the Franche-Comté region of present-day France. There have been Mesolithic occupations found in several caves in the area, which have produced a multitude of stone tools, burials, and even the bones of the now-extinct wooly Rhino that once roamed this area . This individual was carbon-dated to between 15,690 to 15,240 years old. Genetic analysis has found that this individual was closely-related to a number of other hunter-gatherers that lived in Europe between 19,000 and 14,000 years ago . This cluster of ancient DNA samples represented peoples that had lived in Europe as early as 35,000 years ago and had retreated to the southwest corner of the continent during the last glacial maximum. This individual was female and her mitochondrial haplogroup came from the U lineage, which was the most common haplogroup among European hunter-gatherers and still exists in Europe today although at lower frequencies .